‘Habanero’ is the generic name given to all varieties of chillies classified as Capsicum chinense. The species name ‘chinense‘ implies that they come from China, but this is not true: like the other four domesticated species of Capsicum (C. annuum, baccatum, pubescens and frutescens) they are, in fact, New World plants. To confuse the issue, the ‘habanero’ term was originally used to refer to a particular C. chinense variety indigenous to the Yucatan Peninsula, which was shaped vaguely like a lantern (check out the Orange Habanero we sell). Then, there is the term ‘Scotch Bonnet’, which was first used to refer to very hot C. chinense chillies shaped a bit like a bonnet. Use of this term, too, has expanded and is now also often used to mean all C. chinense chillies. Morphologically, habanero plants display certain characteristics that, taken as a group, distinguish them from the other domesticated Capsicum species. For example, flowers grow in bunches rather than singly on a node. The number of flowers in each bunch normally ranges from 2 to 6, although we have counted as many as eight on the Dorset Naga we grow. Flower petals are generally greenish white, but can also be either milky white or purple in some varieties. The fruit usually have an annular constriction between the calyx and pedicel, while the crinkled leaves are wider than those of, for example, C. annuum. Organoleptically, habaneros include some extremely hot chillies, Paper Lantern (300 SHU), Devil’s Rib (400,000 SHU) and Orange Habanero (250,000 SHU). These, however, pale in comparison to the chillies known as the Superhots, which come out on top of the pungency league table at 1,000,000 SHU or more. These are the hottest chillies in the world and include the Bangladeshi Naga Morich, Dorset Naga and Bhut Jolokia (aka Ghost), with Carolina Reaper topping the league having been measured at 2,000,000 SHU. Not all habaneros, however, are so pungent. Some are quite a bit tamer, such as Apricot, an almost heatless variety, and Trinity, which at a ‘mere’ 40,000 SHU, has a manageable heat level that still gives a nice bit of bite. Culinarily, habaneros have a distinctive aroma that has been compared to tomatoes, citrus fruit, apricots, bubble gum, green apples, and root beer. Take your pick, or add you own description. However they are described, they give an unmistakable flavour to any dish to which they are added. Horticulturally, habanoeros are more of a challenge to grow than the generally more amenable Capsicum annuum peppers (which includes the cayennes, jalapeños and sweet bell peppers). This is not to say that they are impossibly difficult, but it does mean that they require patience and a certain degree of pampering. The seeds, for example, may be slower to germinate, while the plants certainly mature later. For the best chance of success, they should be grown in a tunnel, greenhouse or conservatory, but even then, may not produce much up north, at higher elevations or anywhere with a short growing season. To compensate for an unfavourable climate, transplants could be started earlier than usual – mid-January would be ideal – though the extra demands for light and heat may make the effort prohibitively expensive. Given the challenge they present, why grow habaneros at all? For one, they are certainly worth the trouble for their unique aroma alone. A sweet chilli sauce, chutney or salsas that includes habaneros surpasses anything made with a cayenne or other C. annuum chilli. Besides, they offer a huge selection of varieties that differ in fruit types, plant habit and heat levels, making them the perfect choice for jaded gardeners looking for something different to try. And dare we say it, the more pungent varieties are the perfect choice for heat geeks who need a regular fix of capcaicinoid. 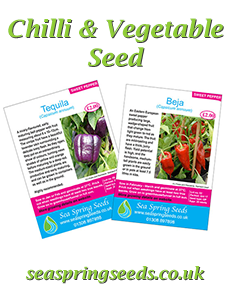 Sea Spring Seeds specialises in habaneros, and the selection of plants and seeds that we offer includes several of our own varieties as well as others not found anywhere else.